Leonard Valentine Weidner. Courtesy of Raupp Memorial Museum, Buffalo Grove, Illinois. [S856] Daily Sentinel, The, 07 Apr 2006. [S11] John J. Weidner, Compiled Birth, Death, 711. [S130] Arlington Heights Herald, 28 Jul 1950, sect. 1, p. 4, col.3. [S486] Leonard Weidner, "Leonard Weidner Family Group Sheet", This family group sheet was completed by Helen Louise Dreiling-Weidner and returned to the Weidner Research Center., did not include father's last name. [S969] Chicago Tribune, 05 Mar 1996, sect. 2, p. 9, col. 3. [S486] Leonard Weidner, "Leonard Weidner Family Group Sheet", This family group sheet was completed by Helen Louise Dreiling-Weidner and returned to the Weidner Research Center. 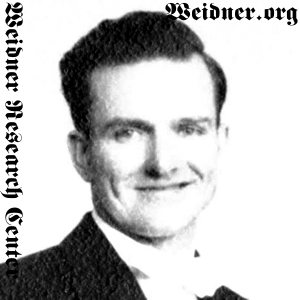 [S11] John J. Weidner, Compiled Birth, Death, 711 birth date only. [S486] Leonard Weidner, "Leonard Weidner Family Group Sheet", This family group sheet was completed by Helen Louise Dreiling-Weidner and returned to the Weidner Research Center., birth date, city, state.